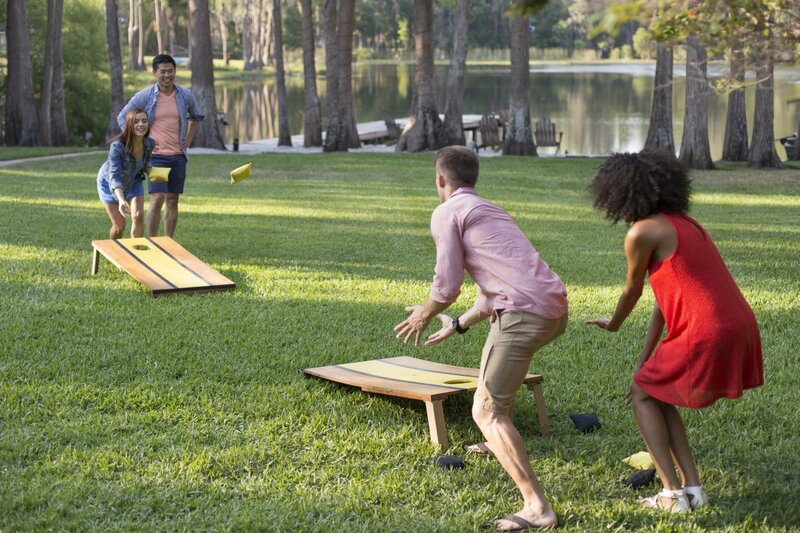 Uncover 18 Extremely Fun DIY Backyard Games sure to make your backyard the place to be on a sunny day brought to you by Ashley Furniture HomeStore! Outdoor living has never been more in. Between the amazing advances in weather-safe furniture and accessories, living outside is anything but roughing it. Memorial Day is on its way. And you know what that means… If you’re lucky enough to have the day off, it’s high time for some chillin’ and grillin’ with family and friends. Ready to get this party started? Mother’s Day is May 13 and this year, we’re spoiling mom in style. The only thing better than a handwritten thank you is a heartfelt brunch in her honor. We definitely suggest skipping the group text and inviting everyone by snail mail. It will certainly impress your guests and most importantly, your guest of honor. Once the date is set, it’s time to get the house prepped. Greet everyone with new and fun decor at your front door. Rely on your entryway to set the mood for the day. Pssst don’t forget a wreath and balloons. It is mom’s day after all. You can also make easy updates inside of your home with fresh plants, flowers, a pouf or two and a bold and bright rug. Whether you’re hosting the gathering inside or out, we love making this portion of the day a laid back and family-friendly affair. 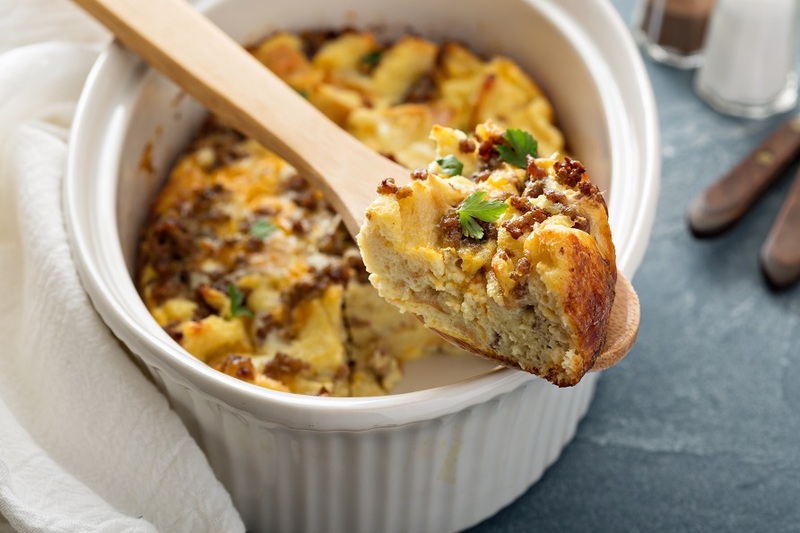 Our brunch recipe is one that people can grab and go as they please. 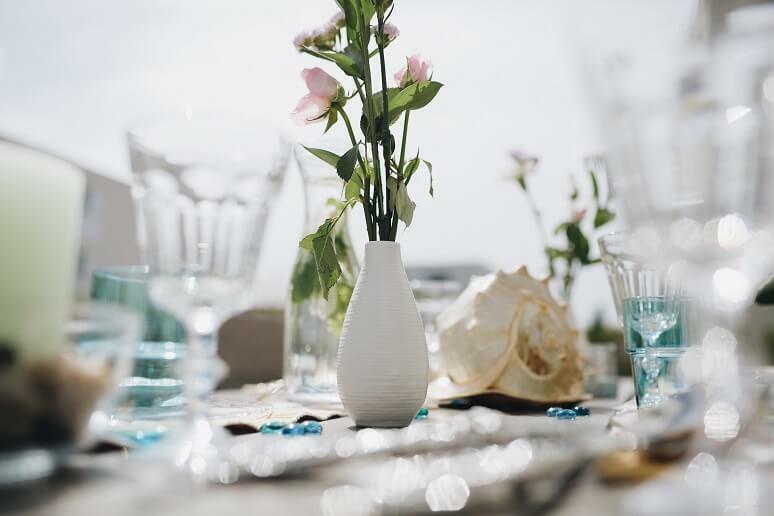 With no formal meal time, it’s more fun to let people mix, mingle and nosh when they are ready. 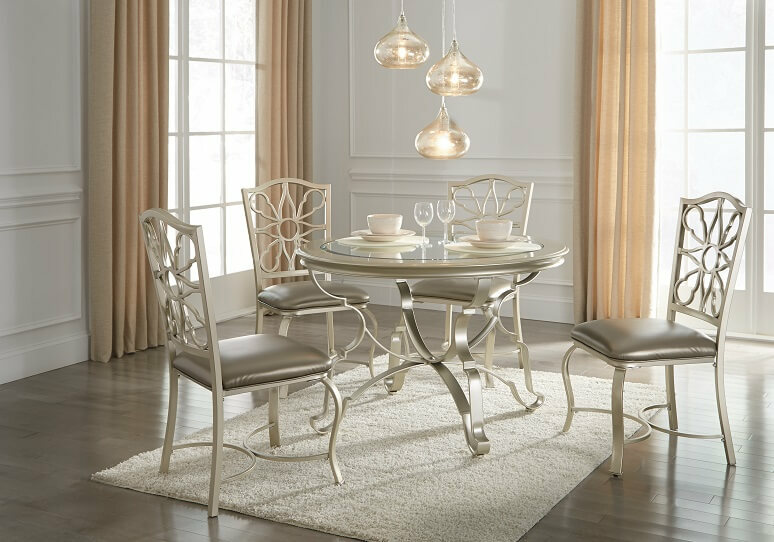 Our selection of casual, chic dining furnitureOpens in a new window and serveware should help do the trick. Night before, or 35 minutes before serving: Preheat oven to 400° F. In large skillet, over medium-high heat, combine sausage, mushrooms and onion. Sauté until sausage is cooked completely. Drain well; season to taste with salt and pepper. Combine eggs and sour cream in blender or food processor; whip 1 minute. Pour into greased 9 x 13-inch baking dish. Bake until eggs are softly set, 4 to 7 minutes. Spoon salsa evenly over top of eggs; add sausage mixture. Top first with Velveeta, then with mozzarella and cheddar. To serve immediately, turn oven to broil; broil until cheeses melt. To serve the next day, refrigerate overnight. Bake at 325° F. about 30 minutes, until cheeses melt. Cut and serve with flat spatula. Create your Dream Backyard Oasis and transform your patio into a getaway for friends and family to relax with Gardens, Lighting, Fire Pits, and more! Moonstruck by moonlight? What better way to enjoy la bella luna than with dinner al fresco. It takes a little planning, but the results are magical. Here are some easy tips. Here are some ways you can use outdoor furniture, accessories, and a little imagination to repurpose your outdoor space for the summer. Define your space with vibrant area rugs. If your outdoor deck, patio or lanai is large and undefined, you may need to set some boundaries. Rugs create visual borders that break up large areas and make it easier to determine furniture placement. Add a little color– or a lot of – for visual impact. Patterns Pop – The geometric design of this rug stands out beautifully against the neutral tone of the sectional. Changing out the rug and throw pillows results in a completely different look. Neutral’s Nice – Slate gray and other earth tones are universally appealing and always in vogue. Color Counts – Bright colors liven up any area. Pair several hues together for a lively look that’s anything but boring. Increase your comfort level with an outdoor rug or two. Warm weather begs for bare toes, but concrete, tile, and hardwood decks can get scorching hot in the dog days of summer. Soft rugs underfoot offer respite from the heat, while strategically placed comfy cushions create much-welcomed back support. Relax. Nuvella® fabric and outdoor rugs are long lasting & easy care. 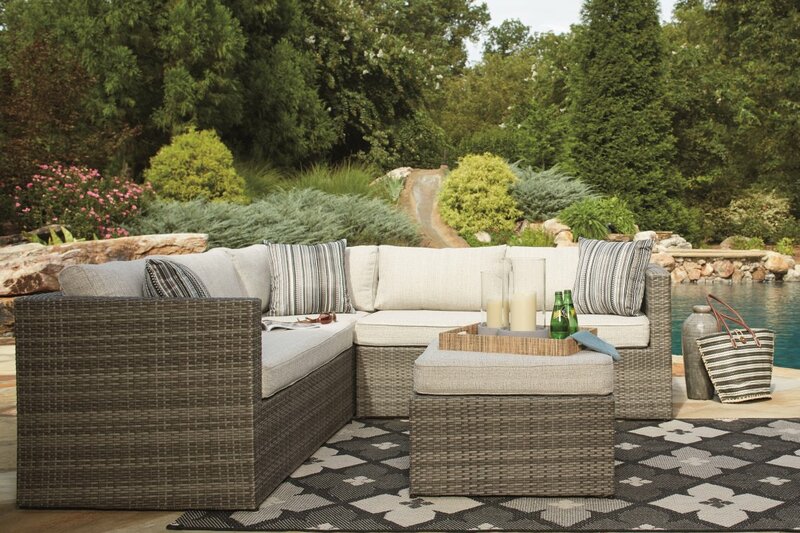 While outdoor furniture is loaded with indoor style elements, it’s still…well…outdoors. Choose pillows covered in weather-resistant fabric such as Nuvella, a high-performing, durable fabric. This all weather fabric repels moisture and stains, and, with proper care, will continue to look bright season after season. Ensure that area rugs are indoor/outdoor, and read care instructions to prevent formation of mold and mildew. Out with last year’s old, in with the new of 2017. 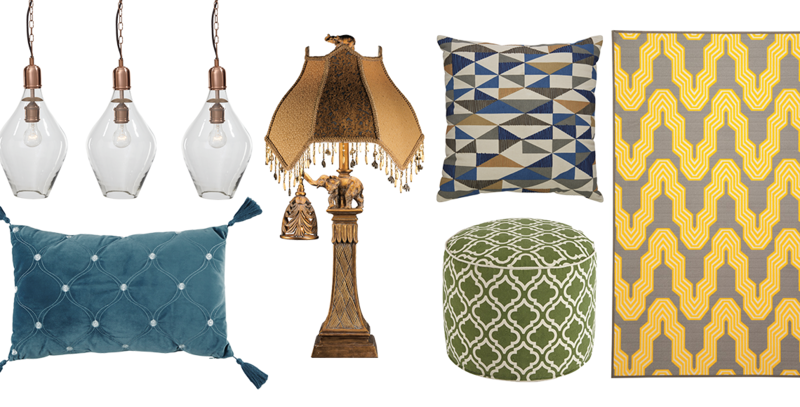 Here’s an A to Z guide of today’s best trends in home furnishings and decor. Artisan-crafted. Bring home an honest feel with goods that have the look of a hand touch. Bold geometrics. Geo patterns are still trending strongly. They’ve gotten bolder in color and scale. Copper. This metal can warm up any room. Edison bulbs. Combined with minimalistic lighting designs, these are a showstopper. Florals. The more opulent the better. Poppies, especially, are on the rise. Hygge. This Danish way of living by creating and enjoying blissful moments has certainly inspired us. Into culture. Trends from around the globe are mixed and matched on various materials with vivid colors and patterns. Jewel tones. So rich and luxurious, these tones bring an upscale appeal to any material. Keeping it natural. The natural aged patina of metal is increasingly appreciated. Low contrast. Take a step back from the high contrast of 2016’s black and white trend. 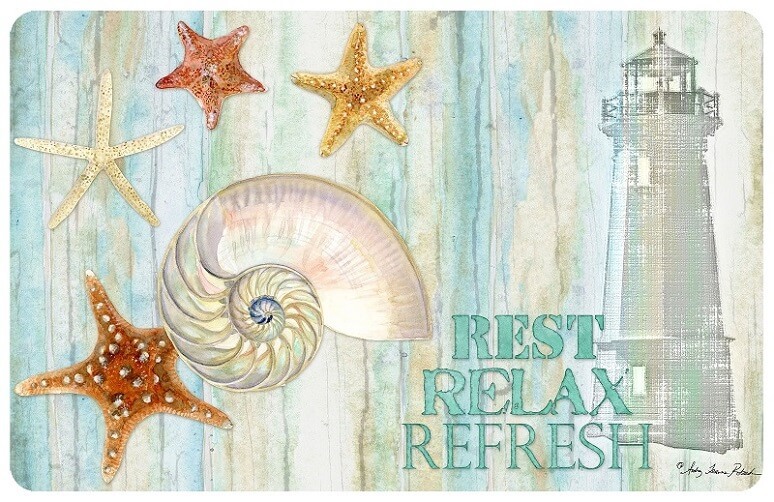 This is all about muted colors and calming environments. Modern bohemian. Feel free to indulge in eclecticism. Noir. Shades of black, rich berry hues and iridescent finishes reflect an alluring aesthetic. Of course, gray. Gray is not going anywhere any time soon. It continues to evolve. Combine it with lilac for a fresh take. Polished and aged goldtone finishes. This is another warm metal that we just can’t get enough of. Queue the country music. Vintage farmhouse style has taken over our hearts. Refined luxury. Make a stylish statement without going over the top. Sleek marble, including faux. Whether the real deal or a fabulous fake, lighter colored marble gives off an ultra contemporary vibe when combined with brass or gold. Tactility. It’s all about the texture, baby. Uber cute birds. Delicate birds are a fresh take on springtime designs. Velvet. Trickling over from the fashion runways into our homes, velvet continues to be one of our most beloved fabrics. Wood grain. We love seeing the natural grain of wood. It’s another piece of nature that we can bring inside. X marks the spot for matte. Take a break from staring at all things glossy to enjoy matte texture. Yellow. Intense yellow hues work well when applied to quality textiles and combined with eggplant purple or gray. Zen. 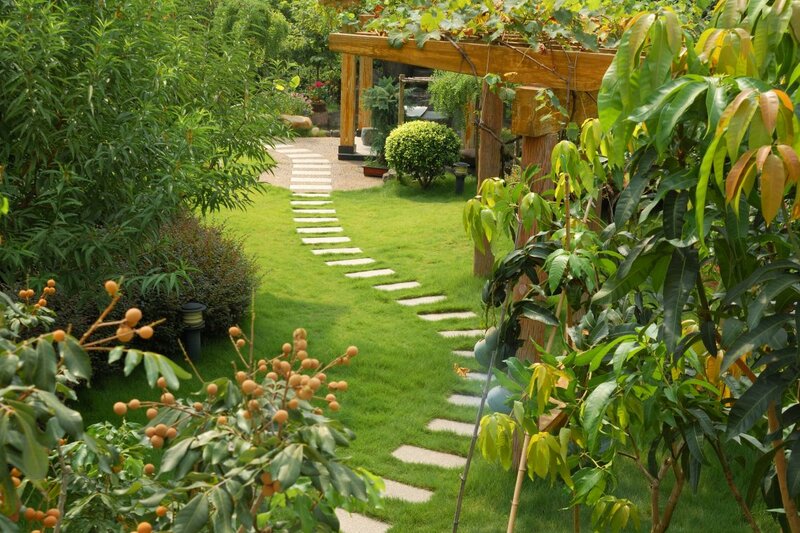 Peaceful yet attractive outdoor living spaces have made themselves known. Enjoy a staycation or two. All eyes are on outdoor furniture, and it’s no wonder why. 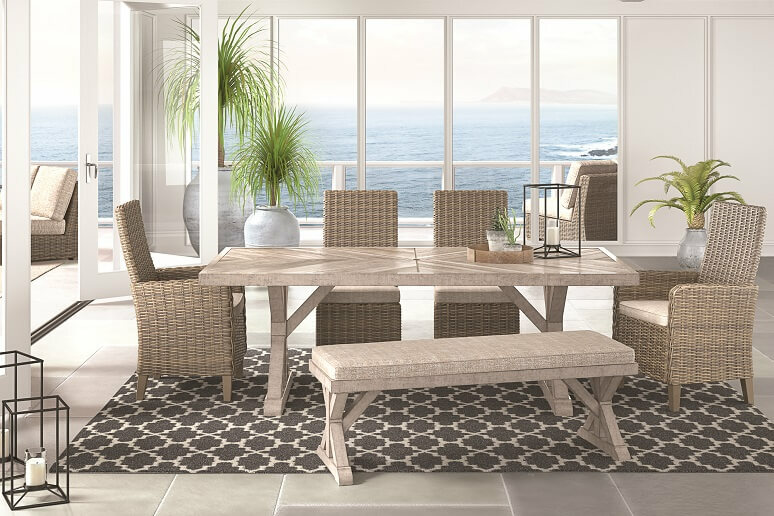 Exquisite style merges seamlessly with all-weather materials for furniture you’ll love relaxing in throughout the changing seasons. However, just as you would with interior spaces, give careful consideration to furniture placement. 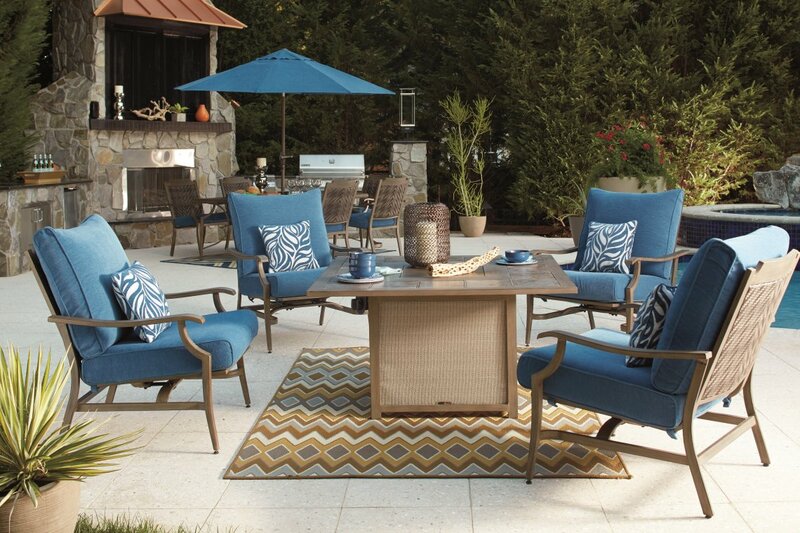 Read on for a few tips on how to arrange outdoor furniture to best suit your landscape and lifestyle. Your eye is naturally drawn to a focal point when you enter a room, even if that room is outside. The focal point could be a fireplace, a paved veranda, or a pool. If your outdoor area doesn’t have a natural focal point, you can create one with furniture. A sectional is a great place to start as it’s substantial enough to draw attention. TIP: Measure your space before purchasing to avoid overcrowding. Similar to decorating inside, keep in mind the traffic flow. 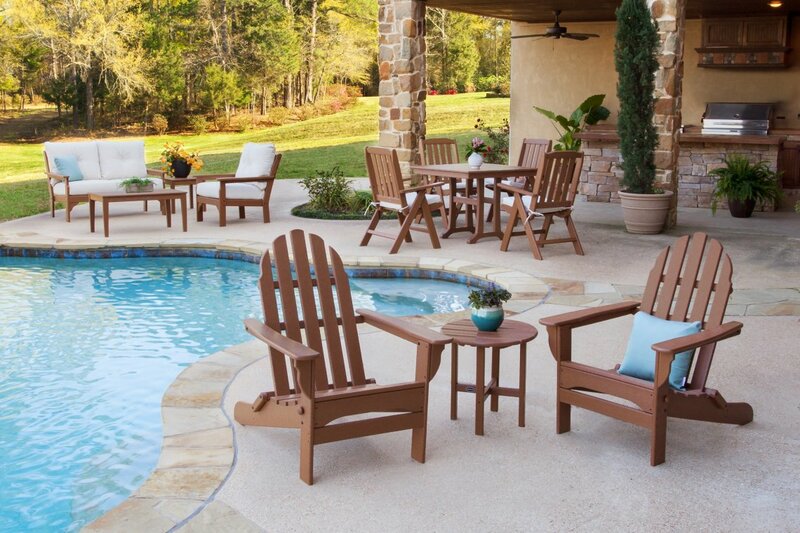 Consider how guests enter and exit your outdoor living space and place furniture accordingly. Try to position furniture so the heavy traffic areas are behind or to the side of the main seating area to prevent foot traffic in front of you or guests. TIP: Use an outdoor area rug to define your space and provide comfort underfoot. If your outdoor area is large, consider multi-purpose zones. You might have a sectional seating group in one zone, a poolside bar in another, and a dining table and chairs in the next. To increase eye appeal, coordinate the zones by keeping color and/or furniture styles consistent, so it doesn’t look like a mish mash. 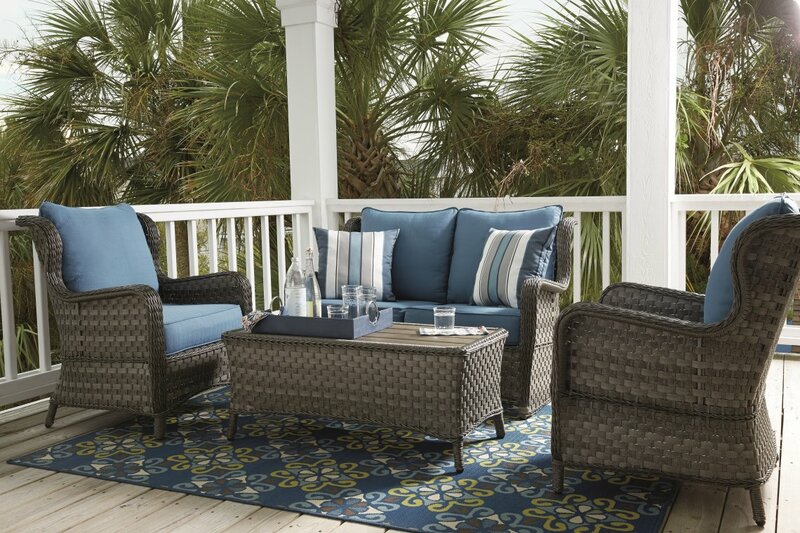 Even if styles are different, just adding color coordinated cushions and outdoor rugs can help bring it all together. 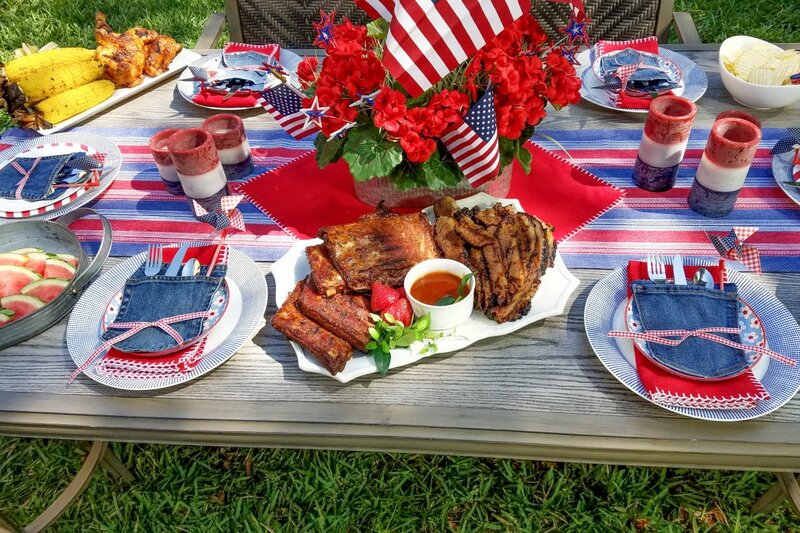 TIP: If you’re a grill master, make sure the cooking equipment is away from the main seating area to avoid enveloping your guests in smoke. Even in the great outdoors, you can feel cramped and crowded if there’s too much furniture. In tight spaces, think about ditching the large dining table and opt for a smaller seating group. You might enjoy a fire table with deeply cushioned lounge chairs for comfortable, casual entertaining. Even better, choose a fire table with enough space for drinks and nibbles. TIP: Furnishings that can pull double duty are ideal for smaller spaces. Ottomans or tables with storage space can help keep the area tidy.